I stumbled across this site while Googling so I thought I'd post this, since there seems to be some discussion going in this thread about the subject I mean to discuss. On occasion I download various non-album tracks from bands I enjoy, burn them, give the compilation a name, and quickly put together a cover. When I do this it's purely for my personal enjoyment, since it's convenient to just pop in a single disc with various b-sides and the like without having to listen to a single track on a compilation, single, or whatever. I've been doing this for years now and I guess it's become a sort of hobby. The main method I use for downloading songs is SoulSeek, and when I do I gather the files into a single folder within my shared folder, name it, number the songs, and place the cover image in there as well. After this I burn the files, print off the cover, and put it on my shelf with the rest of that band's releases. Then, most of the time, I delete the folder promptly. 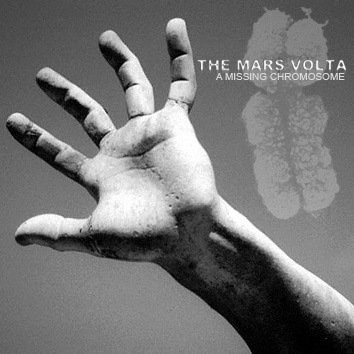 I guess that wasn't the case with a little Mars Volta mix I put together a couple years ago called "A Missing Chromosome." I misplaced my copy and was in the process of putting it back together again, but having no luck finding The Bible and the Breathalyzer on SoulSeek, I decided to look for a torrent of it. Imagine my surprise when I found a very healthy torrent of A Missing Chromosome. A little bewildered I downloaded it, album art and all, then proceeded to Google it. What I found was a little hard to believe. The only explanation I can think of is that someone downloaded it from me, passed it around some P2P networks, and made up a little story about it being official. I had nothing to do with said story, nor the Wikipedia article which I sadly missed, and which would have been fairly amusing to have seen. So there you have it. Loosely speaking, yes, A Missing Chromosome is a "bootleg." The only difference is that I never intended to sell it, let alone have anyone but myself listen to it. Any stories about it being official or being released only to radio stations (does that even make sense?) are completely false. Since there seems to be some debate about its authenticity, I assume that this post will be shot down, so I'll bring in the only evidence I can. The DNA molecule on the cover is from this image, which I found by simply Googling the word "chromosome." It's on the first page of Google Image Search still, if you want to check it out for yourself. The main image is from a photograph of the Fontana Dei Quattro Fiumi in Rome. I can't find the original anymore, but it was beautiful. And that's about it. While I do find this amusing, it does raise a problem. I was originally just going to let this whole thing play out and not get myself involved, but belief that A Missing Chromosome is official seems to be fairly widespread. This would make it seem extremely rare if it were real, and any copy popping up on eBay could very well go for a lot of money. Since it is, of course, not real, then any copy available for purchase would be a bootleg, and the fans who purchased them would have been ripped off. If everyone believes what I have to say in this post, then I'll rest easy knowing that it won't come to that. для англонепонимющих, кратко - однажды чувак собрал все би-сайды тмв. скачал из нета пару фоток и сделал обложку. сохранил все это в одну папку, распечатал\запсал, поставил на полку и забыл. но все это дело быстренько распространилось через p2p-сети типа суслика и фанаты решили, что это мега-рар-радио-онли-промо-сиди.